Although it may not feel like it today here in rainy NYC, spring has finally arrived and that means lighter, detoxing foods that are full of flavor! Soon we’ll be hitting the famers market in search of colorful produce to add into our cooking. Spring is also a great time to experiment with new flavors, be it a subtle sweetness or a bold spice. 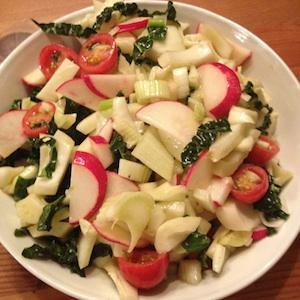 This fresh fennel salad recipe from 2013 IIN graduate Rachel Tuomey calls for radishes, a great detoxifier, and the fennel adds a hint of healthy sweetness. Enjoy it for a light outdoor lunch, or pair it with this apricot lentil soup for a tasty spring combo.